I recently ordered The Bear ( for my Graeme-bear's room! ) from Stacie Bloomfield's Etsy shop, Gingiber. There was a little mix-up with my order and I received the Owl Alphabet instead. Stacie was a sweetheart about it and fixed the situation along with letting me know that the sweet alphabet print was mine to keep. I would love to keep it, but I already have some alphabet goodness thanks to my sister-in-law, Sara! Stacie's work is original and beautifully done. And, woot woot, Gingiber was recently named the number one Nursery Decor Etsy Shop by Babble.com! ps. If you are thinking about placing an order at Gingiber, hurry, because Stacie is still giving away free 2012 Gingiber calendars with any order over $20--and they are wonderful! i would love to win! this would be cute in emmy's room! and my favorite thing so far from etsy was purchased for me... but i pointed my brother were to get it... wine glasses made from old wine bottles. love them! what a cute print - would love that for E's room! my fave purchase was an Australian stamp necklace that I purchased for my SIL who's from Australia. and I'm a faithful follower, oh yes I am. :) I will consider sending my first born to you for a couple of weeks. hehe. 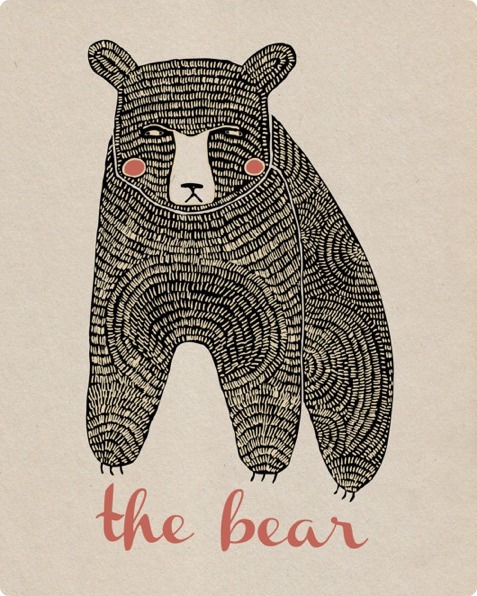 I love, love the bear print....so , so cute....and I love the graphic style as well. Great find sis! I've ordered some tatting patterns off of Etsy!! I just got a Katie Daisy print off Etsy. It says, Peace on Earth. I LOVE it!!! Since the birth of my daughter is just days away (hopefully!) I have my eye on the adorable headbands at Snugars, but I've never purchased anything--yet!